In the Star Wars prequels, the scene in which Anakin cements his full loss of innocence and descent into the Dark Side by slaughtering the room full of Jedi younglings is likely the most horrific of the entire film saga. It is, however, more horrific due to what it represents about Anakin’s character and in theory than it is personally horrifying, simply because we don’t know these children as people. We might mourn the Anakin we knew and feel a deep sense of unease when we later rewatch Attack of the Clones and realize that these bright-eyed, innocent young Jedi in that one scene will be murdered by one of their own in the not-too-distant future, but because we don’t actually know the children, there remains a bit of a remove. The cruelest thing about this Clone Wars arc, of all the arcs, then is that it actually introduces us to these kids and gets us to care about each of them as an individual person…or Wookiee or what have you. It encourages us to feel joy at their youthful enthusiasm and hope, never once alluding to their imminent demise via even the most subtle of foreshadowing, and yet because we know what will happen to them, we can’t help but taste a bitter sting of sorrow underlying these episodes. And that is one of the reasons this is such a brilliant, confronting show. It never shies away from or allows us to forget the full implications of the saga’s tragic underpinnings, managing to tell a story that can be lighthearted and uplifting in the moment, even while it grows deeply sad when placed in its larger historical context. A lesser show would probably deal with the Younglings issue by dancing around it all together, while Clone Wars tackles it head-on, thereby making the events of Episode III even more desperately heartbreaking. At the same time, however, it’s handled with such delicacy that a child watching these episodes alone wouldn’t necessarily even connect those dots, enabling it to appeal to Star Wars viewers of all ages, even those not yet old enough to grasp its full implications. The episodes also allow us a glimpse into a piece of Star Wars mythology I had always wondered about, namely how Jedi build their lightsabers, along with delving further into the training of young Jedi, which we had gotten small glimpses of previously but never to quite this extent. I love that the answer proves to be just as much a marriage of mysticism and technology as the Jedi have always represented, both as far as the task of finding the crystal that powers each lightsaber–each young Jedi must go on a vision quest of sorts to find her own personal crystal, each of which only reveals itself to the youngling once she has completed a task uniquely designed to teach a lesson specifically tailored to her, and done so not by Yoda but seemingly by the Force itself, which can intuit which personality flaw or psychological complication each must overcome in order to become a full Jedi–and as far as the actual process of assembling the weapon, which is also done via the Force, each intricate piece floating into place through the youngling’s own concentration and attention to detail. One can imagine that, at some point between The Empire Strikes Back and Return of the Jedi, Obi-Wan’s ghost took Luke through the same process in order to construct his lightsaber. It’s also fantastic, as ever, to see how much Ahsoka has grown. In “Lightsaber Lost,” we got that wonderful, brief scene in which she imparted the lessons she had learned that day to the room of younglings, and here she takes on the role of full teacher, alongside Yoda, in the children’s task, afterwards charged with getting them safely home. It wasn’t too long ago that she was one of them. The arc then cleverly twists the situation when the ship is attacked by Hondo and his pirates and, after initially acting as the children’s protector, finds herself having to be rescued by the children, which includes one of my favorite sequences on the series to date, when the kids join the circus as an acrobatic act, in order to infiltrate Hondo’s camp. As it’s happening, nothing feels quite as perfect as the idea of Jedi children using their Force skills in order to do circus acts. And later on, the story twists yet again, when just when the situation seems most dire, the ever-mercurial and morally ambiguous Hondo ends up joining forces with Ahsoka and the younglings to fight a common enemy, Dooku, finally taking revenge on him for his having captured the Sith Lord all the way back closer to the start of the series. While Clone Wars was unfortunately canceled before its intended date, at least moments like this make the story feel as if it is coming to a head, naturally. Meanwhile, Hondo revealing a moment of kindness to the Jedi girl is a nice flip-side to the fact that underneath other seeming heroes’ faces lurks evil ready to pounce on the Republic. My favorite aspects of these episodes are probably the characters of Gungi–an adorable Wookiee youngling who I wouldn’t be surprised ended up being discovered by the Jedi after Ahsoka had her adventure with Chewie on the hunters’ planet, and who, due to our knowledge of his likely future, also breaks my heart–and Professor Huyang, an over-1000-year-old droid who guides younglings along the process of building their lightsabers. He is voiced by the one and only David Tennant, best known as the Tenth Doctor in Doctor Who, and who actually won an Emmy award for this performance. 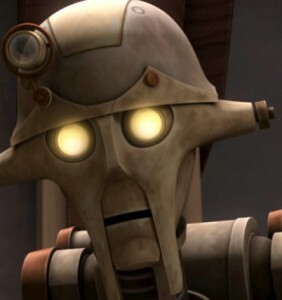 In a very short time, he creates a full character out of Huyang: a funny, precise, eccentric, extremely wise character–not unlike other Jedi, despite the fact that he is a droid–who, in the best reveal of the entire arc (and maybe the series), alludes to having helped the young Yoda fashion his lightsaber, countless years ago. I only wish that there was more time to spend with this wonderful character!